1. Air pollution is the primary source of thousands of diseases and damages of the spacious of the planet earth and the largest source of the current global warming issue. -Smog Free tower world’s first and largest air purifier (smog vacuum cleaner) is not only solving the air pollution, safety, and healthcare issue but also building awareness within the society through their jewelry with the Smog Diamond. -The Dutch artist and innovator, Daan Roosegaarde believing that his creation will solve the issue of the billions of people’s rights to clean breath air. – By sharing a Smog Free Ring, you donate 1000 m3 of clean air to the city. In 2017, Roosegaarde presents a new addition to Smog Free Project: the Smog Free Bicycle. – Collaborate with the government organizations and establish a long-term contract for the clean air projects investment using the smog-free tower. Excess CO2 contributing to a greenhouse effect and global warming. Energy is essential to life and all living organisms. With population explosion, rapid growth of industries and urbanization, there is an immense need to develop technologies/strategy for energy usage. Every year, 7 million customers experience power outages. Outages that last more than 5 to 10 minutes cost customers more than $80 billion each year. So here is a technology where in we could share the energy that is being produced by our alternative renewable energy sources like the solar panels or the wind energy during outages. Sharing is caring. It is nice to Share..!! Technology: Scientists have developed algorithms that would allow customers to use and share power from their renewable energy sources during outages. This can be done by strategically disconnecting devices, called solar inverters, from the grid. During an outage, because of the perpetual connections with the grid, it is impossible for the owners to draw on power generated by their own renewable energy sources. A team of engineers from University of California, San Diego have developed an algorithm that would allow consumers to use and share power from their renewable energy sources. This algorithm has the capability to prioritize distribution of power from renewable resources. It can also be programmed to include priority functions based on different parameters. The equations in algorithm consider forecasts for solar and wind power generation as well as how much energy storage is available, including electric vehicles, batteries and so on. The algorithm combines this information with the amount of energy that the consumers are projected to use as well as the amount of energy that a cluster of homes/communities/businesses can generate. Step one: Showcase the reliability of the technology to the public, private entities and to the customers. Attract more investors and spread awareness about the usage to this technology. Step two: Initiate regulation change nationwide, which would allow consumers to sell power to other business/residential owners. Step three: Find companies / corporate that could use this technology in their buildings/businesses to demonstrate the efficiency of the technology. Until new regulations are in places this technology can be equipped with renewable power sources that would use constant power and do not have backup generator. Step Four: Collaborate with the Public/Private governing body, urban planners and other organizations to integrate this technology to the communities. Trash accumulates in ocean creating large garbage patches. If left to circulate, the plastic will impact our ecosystems, health and economies. I believe this technology can solve the issue of ocean garbage by cleaning up what has already accumulated in the ocean and needs to be promoted more by the government, intergovernmental bodies or independent private entities. 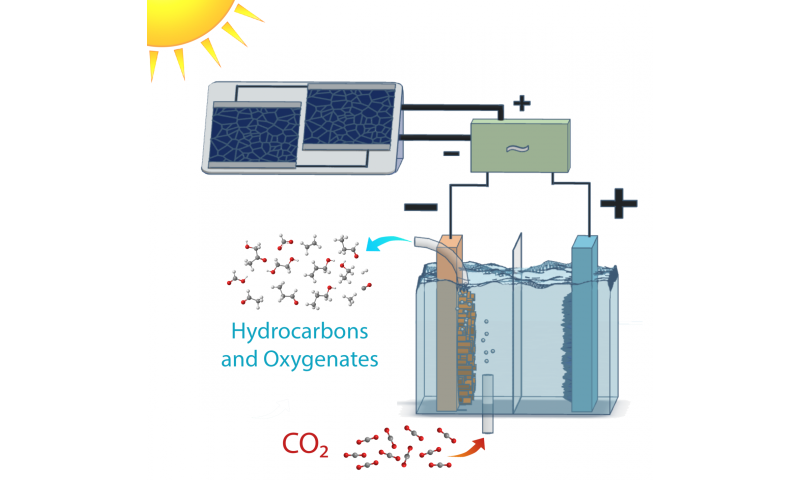 The new technology enables sunlight to convert carbon dioxide into usable forms of liquid fuels, such as ethanol and ethylene. Scientists at the Department of Energy’s Berkeley Labs developed the technology, which has reached efficiencies as high as 5%, reducing CO2 to a hydrocarbon end product over a certain amount of sun-time. The technology can also function in low-light settings, although the main interest in this case would be the reduction of CO2 and the ability to use Solar-powered fuels at any time of the day, so whether o not the technology works at night isn’t as relevant, since the byproduct of the technology (the fuel) can be used at night. THis helps solve the issues must-take forms of energy face. The main science behinf the technology is a “copper-silver nanocoral cathode” which breaks the CO2 down, and “an iridium oxide nanotube anode, which oxidizes the water and creates oxygen”. 3. Organizational Stakeholders: Scientists at Berkeley, Developers/Manufactuers, the Government (DoE project). 3 – Engage utilities and contract developers to begin working the technology into the energy industry. Problem: The Japanese honey industry is declining due to deforestation and the increasing use of pesticides such as neonicotinoids in rice farming. While other countries are also experiencing colony collapse disorder*, Japan is particularly vulnerable to the advanced age of its farmers and a decline in beekeepers. As honey bee takes vital function of pollination in ecosystem, decline in honey bee population is a problem of whole nature in Japan. This is not a type of cutting edge technology, but rather, a creative idea and activity named “The Ginza Honey Bee Project” based on civic idea how to cope with ecological problem by applying existing expertise and civic engagement in the middle of city and also stimulate local economy. In today’s world, a growing population, global climate change and inefficient water infrastructure raises concerns for equitable access to clean drinking water. Currently it is estimated that 783 million people lack access to potable drinking water. Lack of potable drinking water contributes to a range of public health concerns such as spread of disease and illnesses, deaths, and inability to grow food. The Warka Water Tower was developed by an Italian architect named Arturo Vittori with his studio Architecture and Vision. It serves as an innovative technology to address concerns for access to water in developing countries in addition to their accompanying public health problems. Stakeholders in this effort that would be relevant are the existing team of designers, architects, and developers. Additionally, marketing and investment teams would be beneficial to help Warka Water meet their goal of mass production in the year 2019. Outreach and construction teams should be assembled to promote these structures in developing countries to educate community members on how to construct and use the tower along with its other functions such as the Warka garden, drone, toilet, and house. Warka Water’s next steps should involve assembling an investment and marketing team to gain funding for their innovative designs. This will allow them to bring the tower to mass production and enhance funding in their design and development of other Warka products. They should additionally consider NGO partnership to install and promote acceptance of this technology in developing countries. Check out the following links below for more information! Food waste is both a critical environmental issue and an economic challenge. $218 billion is spent annually in the US to grow, process, transport, and dispose 52 million tons of food that is never eaten! Food waste consumes 21% of all freshwater. Spoiler Alert is a software company founded by two MIT Sloan graduates to help organizations manage and track unsold inventory. Spoiler Alert’s online management platform creates secondary markets to sell remaining inventory to discount buyers or connect with/donate to NGOs. It allows companies to generate new revenue and tax benefits, as well as minimize waste costs by reducing food surplus. Organizations such as farms, food businesses and NGOs must acquire and install the technology. Integrate or sync the technology with existing inventory management systems. Train employees on the use of the software. Increase awareness of the tool: the success of the secondary marketplaces depend on scale.